Mitokusan Sanbutsuji temple is Tendai Buddhism Temple located in Mt. Mikoku (900m). The record of the temple said, it was established in 706. It was established as practice mountain of Shugendo. In 849, Prist Ennin constructed Garan building and enshrined the statues of Amida, Syaka and Dainichi. Therefore, the temple was named Sanbutsuji Temple, means temple of three buddha. There are many historical buildings including Nageiredo in this temple. 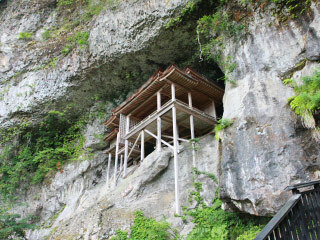 Therefore, the entire sites of Sanbutsuji is designated as national historical site and scenic beauty. Nageiredo is the inner sanctuary. Legend said, it was constructed by the psychokinesis of a priest. In fact, it is great mystery that how it is constructed in such a cave under the cliff. The researchers estimate that it was constructed between 1086 and 1184. This building consists the all aspects of Heian Style building. In this period, Japanese art and culture developed uniquely, and released from the influence of Chinese culture because the trading between China and Japan had been stopped over 100 years. It's a harmony and unity of Japanese Shinto, the respects of Nature, and Buddhism. Nageiredo literary means temple place by throwing. The real name is Zao-Gongendo. Zaogonen is the united of Buddha and Japanese Kami. Top photographer of Japanese temple and shrine, Mr. Domon said "I've seen all temples and shrines in japan. If someone asks me what is the best architecture, I have no doubt to pick up Nageiredo is the best architecture in Japan." This Shugendo let Shugenja experience the reincarnation. Enshrines Syaka, Amida and Dainichi. The river represents the entrance of the heave. Built in 16th century. The national important cultural asset. Built in Muromachi Period. The national important cultural asset. Those two temples shows the sight of heaven. The bell is 2 tons weight. No one knows how it was curried up to this high mountain. Ringing the bell remove the past evil and sin. It stores the sacred scrolls from Shugenja. Built in early Edo period. The pass goes inside the cave. That represent woman's body and rebirth. Built in late Edo period. The national treasure of Japan.